Our Eudaimonia! 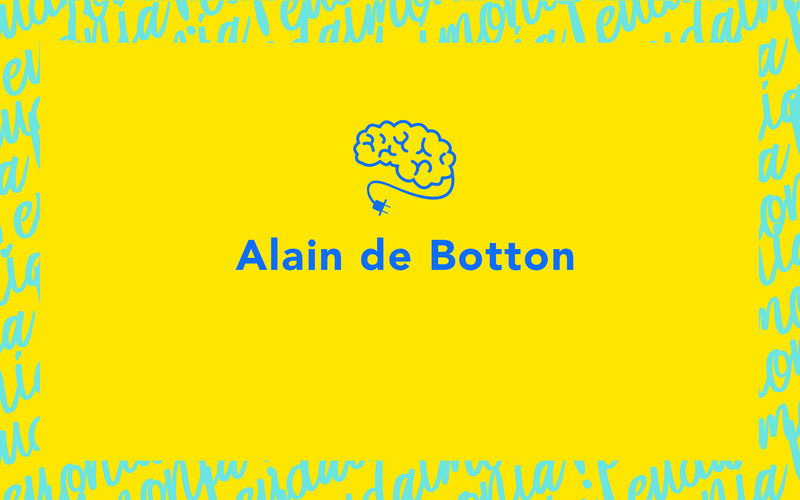 movement has begun, with a mission to discover what it really means to live well in the 21st Century, who better to help us than Alain de Botton? Alain joined us as the keynote speaker at our first Eudaimonia! event, held in partnership with The School of Life. He was keen to get involved with the movement as it’s so in line with what he and The School of Life have been working towards for some time - helping people learn how to be happier and more fulfilled in their daily lives. Alain began his keynote by taking us back to ancient Greece - where the word Eudaimonia came from. He informed us that, interestingly, Plato’s dialogues were, more often than not, set in gymnasiums. "Greek culture was very different from our own in that it placed exercise not in a box on its own but as part of a fulfilled life, that the ancient greeks referred to charmingly as Eudaimonia. "This was the the word they gave to the notion of flourishing in all areas. Not just the physical but moral, spiritual, ethical, communication." Greek culture was very different from our own in that it placed exercise not in a box on its own but as part of a fulfilled life, that the ancient Greeks referred to charmingly as Eudaimonia. So Socrates and his friends were more than happy to discuss what love is and how to be good whilst working on their physical selves. Actually the history of philosophy begins in the gym. How fitting that we should all be sat for our very first Eudaimonia! event in the middle of our YMCA gym. In the past 150 years, Alain said that the idea of trying to develop our capacity to be more fulfilled has been placed firmly back on the agenda. "We’ve decided work should not be about suffering and relationships should not be about endurement, they should be about flourishing." However, the ‘big headache’, according to Alain, which has stopped us from really flourishing and working on our wellbeing, is Romanticism. "Romanticism is a belief system that thinking too much is a problem and that rationalising things squeezes the life out of them and that feeling is always better than reason. "In some areas of life this is fine but when we have decided to improve our lives too much rational thinking is alien." Interestingly, Alain muses, the structured and rational thinking is acceptable in relation to our bodies, but when you apply this to the mind, it’s seen as mad. "If you said to a friend I’m going off to a place to strengthen my capacity to interpret and withstand envy… this would sound totally weird - it shouldn’t. If we succeed today it will be the beginning of the revolution where we learn to place the development of physiological capacities on the same footing as other capacities." If we succeed today it will be the beginning of the revolution where we learn to place the development of physiological capacities on the same footing as other capacities. Alain was also keen to disparage the Romantic notion of doing things by chance. "We don’t perform brain surgery by chance… this business of in chance, this romantic idea that we’ll just pick it up, has got us into deep trouble. It is time to start training systematically to be happy and a good person." But, in today’s world, how do we do this? It’s fairly simple according to Alain. "There is enough experience in the world - we can reverse engineer out of the most fulfilled lives and there are lessons to be transferred down the generations." We don’t perform brain surgery by chance… this business of in chance, this romantic idea that we’ll just pick it up, has got us into deep trouble. It is time to start training systematically to be happy and a good person. There’s the healthy attachment when someone says ‘you look nice’ and they want a relationship and you don’t get freaked out. You don’t think there is something wrong with them, you get to know them and you start what’s known as a secure relationship. Shockingly, according to Alain, only around 20% of the population is securely attached and therefore capable of a naturally trusting relationship. The second way is the avoidantly attached relationship, which is apparently where most of us are. This is because we’re not great at communication. Someone may disappoint us but we don’t tell them. Alain explains this is because we haven’t had a history of talking to people about how we feel. "We... are desperately unable to convey the content of our feelings in ways which won’t frighten others and which will lead them to understand us, give us what we want or interpret us with sympathy." The final and probably most dangerous of the three ways to be in a relationship, is anxious and controllingly attached. This is when one person will blame another for things and try to control them because they themselves are out of control. It’s easy to imagine that solving this is easy - we should simply all try to be in ‘healthy attached’ relationships. So why are only 20% of us able to do this? According to Alain, it’s because "our brains are deeply erratic and flawed machines... for the conditions of modern life". "It’s incredibly hard to know what you are feeling and to convey that knowledge to another person in way that won’t frighten them. Our levels of self knowledge are mostly at rock bottom. "Most people, when they meet you can within 5 minutes experiments show learn things about you that you may be in yours 50s before you realise. The knowledge of the stranger is infinitely superior to the knowledge of the person who actually has to be us. The knowledge we can get from inside is incredibly compromised." It’s incredibly hard to know what you are feeling and to convey that knowledge to another person in way that won’t frighten them. Our levels of self knowledge are mostly at rock bottom. Alain explains this is because most people don’t tell us what we’re like. They avoid feedback so we wander through the world unaware of what we’re really like and this is something we need to try to correct. The first step, Alain says. Is "making friends with the word mad". Most of us are a little mad he says. We need help and it’s not a problem to need help, it’s starting point. "We don’t need people to be perfect in life…. The goal is to get a handle enough on your madness and on the areas that you’re working on in your character, that you can explain to another person who you are and where you’re likely to cause a bit of trouble ahead of the moment when you actually do so." Although, as Alain acknowledges, this may be the basics of physiology, it seems becoming a little more self aware, better at communicating with others better and putting some time into over thinking and structuring work on your mental flaws, may help us start to live a little better and a little more fulfilled. Find our more about how you can stay informed and get involved in our Eudaimonia! movement.